"I think the population is losing half of the human brain power by not encouraging women to go into the sciences. Women can do great things if they are encouraged to do so." Shaesta Waiz flew around the world solo in a Beechcraft Bonanza A36 aircraft in 2017, becoming the youngest woman to circumnavigate the globe in a single-engine aircraft. The purpose of the global flight was to inspire the next generation of STEM and aviation professionals, particularly girls. Shaesta flew over 24,000 nautical miles on her 145-day journey, visiting 22 countries and inspiring over 3,000 children and young adults along the way. Shaesta is the first certified civilian female pilot from Afghanistan and the youngest woman to fly solo around the world in a single-engine aircraft. Who: Shaesta Waiz was born in an Afghan refugee camp and was raised in northern California after her family escaped to the United States during the Afghan-Soviet war in the late 1980s. She and her five sisters attended an underprivileged school district where substitute teachers, sharing textbooks with classmates, and watching friends drop out of high school was the norm. As a young girl, Shaesta believed her future consisted of getting married at a young age and starting a big family. 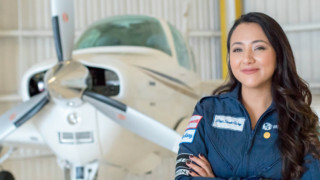 It wasn’t until she discovered her passion for aviation at the age of 18 – after being fearful of airplanes and flying as a child – that she started thinking about attending college and becoming a pilot. What: Shaesta flew around the world solo at the age of 30 in a Beechcraft Bonanza A36 aircraft, becoming the youngest woman in history to circumnavigate the globe solo in a single-engine aircraft. Her mission took her to 22 countries across five continents, crossing three oceans and many seas. On this journey, Shaesta held 32 Outreach events in 14 countries, inspiring more than 3,000 young girls and boys to work hard, never give up, and follow their dreams. She is also the first certified civilian female pilot from Afghanistan. When: Shaesta founded the non-profit organization Dreams Soar, Inc. in 2014 and spent the next three years planning her flight around the world and defining her outreach program. She departed from Daytona Beach International Airport (KDAB) in Florida on May 13, 2017. The entire journey took 4-1/2 months (longer than planned due to three significant weather delays), and Shaesta completed her global solo flight by returning to KDAB on October 4, 2017. How: After receiving a scholarship to kick-start her advanced education, Shaesta attended Embry-Riddle Aeronautical University and earned both a Bachelor’s and Master’s degree, the first in her family to do so. 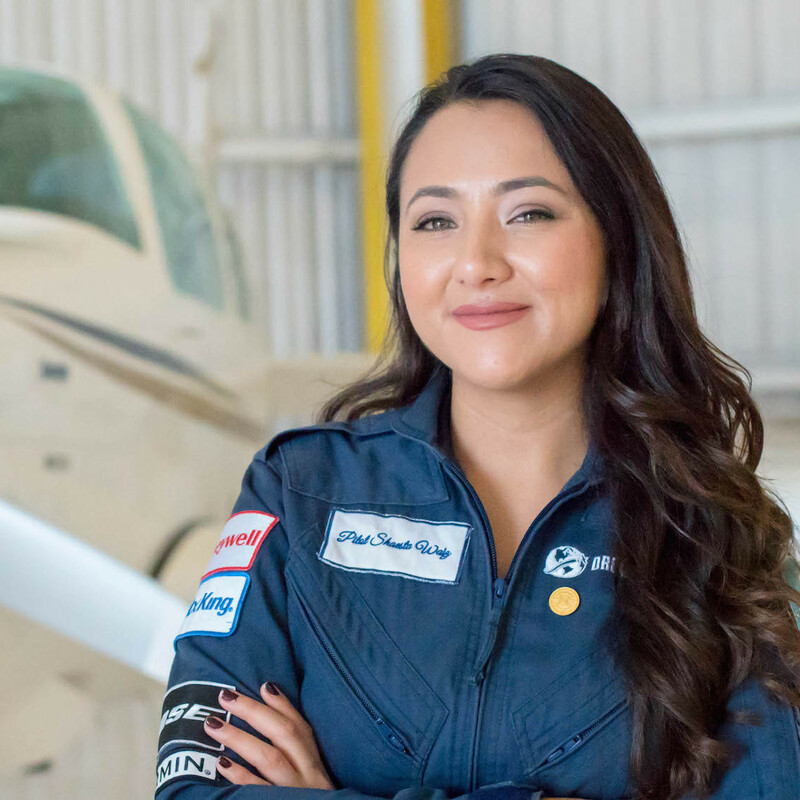 While at Embry-Riddle, she founded the Women’s Ambassador Program, an initiative that seeks to mentor and support young women pursuing an education in aviation and engineering. Wanting to advance her efforts to a global scale, Shaesta founded the non-profit organization Dreams Soar, Inc. in 2014, as an initiative to share her story with girls and women around the world. The Dreams Soar organization consists of a “Dream Team” of college students, recent graduates, and seasoned advisors. With support from her team, along with industry partners and organizations like the International Civil Aviation Organization (ICAO), and many organizations and supporters at each of the 30 stops, Shaesta was able to fly around the world solo in a Bonanza Beechcraft A36 single-engine aircraft. Why: The mission of Dreams Soar, and the purpose of Shaesta flying solo around the world, is to inspire, empower, encourage and support girls and women around the world, to let them know it is possible to achieve their dreams regardless of the challenges and traditions they may face. By holding outreach events and providing scholarships, Dreams Soar hopes to empower children to have the courage to enter STEM and aviation career fields. Shaesta stands tall as a role model for girls and boys and adults of all ages, proof that anyone can achieve their dream if they are brave and work hard. Every time Shaesta opens the door to an aircraft, she asks herself, “How did a girl with my background become so lucky?” The truth is, anyone can be her. Join the STEM Gems Movement! 21% of girls say their parents have encouraged them to be an actress, while 10% of girls say their parents have encouraged them to think about an engineering career. What was the best advice you gained by reading the STEM Gems book? Why do you think it’s important to get more women in tech? What stereotypes about girls do we need to overcome to excel in STEM? How do you apply the math concepts you learn in school to your daily life? What is your favorite technology, and why?